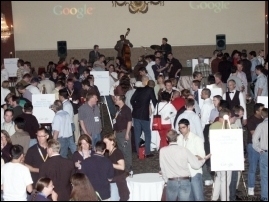 Google will hold a special early evening reception at WebmasterWorld's PubCon in November 14-17, 2006 at the Las Vegas Convention Center. "Many will remember Google held a similar event called 'Meet the Engineers' at our conference in New Orleans last year," said Brett Tabke, PubCon Chairman and WebmasterWorld Founder. "This event will focus more on Google's current Webmaster service offerings and there will be numerous Googlers on hand to answer webmaster questions. In addition, there will be many product demos of new things coming out of the GooglePlex in the coming months." Called, 'Safe Bets From Google,' it will feature Google products with rock-solid reliability for webmasters who, whatever else they may do in Vegas, don't gamble with their websites. WebmasterWorld's Search Engine & Internet Marketing Conference, PubCon, is supported by the Internet industry's leading businesses, including (as of October 31 2006): AdBrite, Arquan, Ask.com, Best of The Web, Bitscape IT Solutions, Blogsvertise, Captures, Card Service Loud, Casino City, ClickTracks Analytics, Did-it Search Marketing, Efficient Frontier, ForgeBusiness, Fortune Interactive, Google, ISEDN.org, JoeBucks, LivePerson, Market Leverage, Moniker, Mountain Media, Opera Software, Page Zero Media, PayPerPost, PositionTech, PRWeb, Revenue Magazine, SearchEngineWorld, Search Marketing Standard Magazine, TechPad Agency, Text Link Ads, Topix, Trellian Software, TrueLocal, Visicom Media, WebmasterRadio, Website Magazine, Wordtracker, WebmasterWorld, Yahoo! Publisher Network. WebmasterWorld's PubCon events are for thought leaders in search engine and Internet marketing professionals to gather to share best practices in the, design, development, promotion and marketing of their businesses and brands. WebmasterWorld is the leading source for Search Engine and Internet marketing news, best practices and educational events. Founded by Brett Tabke, an early '80s innovator in running BBS (Bulletin Board Systems), initially on SearchEngineWorld.com, the WebmasterWorld.com Forum began in 1996 and is now the largest community of online marketing professionals with more than 2 million posts and more than 100 discussion topics.